gifts adding to the fun. I love this casual party. a bit of French as well. the joy of the season will still linger. 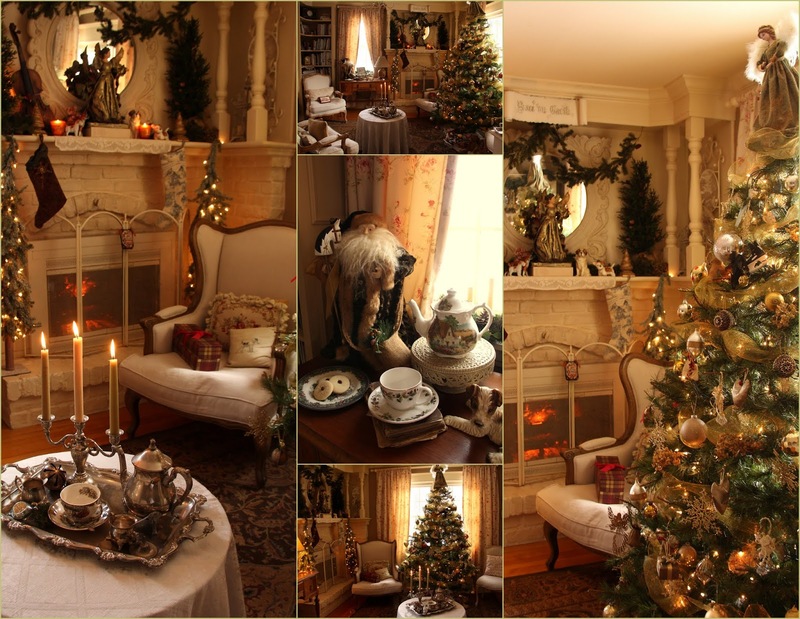 An enchanting room with cozy ambience for the season. It would be wonderful to sit down to tea with you and chat Carolyn. Your home is the perfect meeting place for family and friends. Everything looks lovely with all your special touches. Your tree really is beautiful and the tea tray invites one to sit and enjoy a cup of tea! Merry Christmas, Carolyn! Simply beautiful, Carolyn. Wishing you and yours a happy Christmas celebration. I'd love to sit and have tea with you! Carolyn, each time you share a room in your home, I marvel at the charm and beauty. Merry Christmas to you and your family. Lovely and as you said it will all be over in a few, but may the Joy and Peace linger all the new year through! So cozy and love the look! I have the same dishes! Love them! I'll have ti get them out! YTHIS year went with ironstone creamware ans sleigh rides! Filled my kitchen with old fashion children and trees! All sparkly and old fashion ! Love this time ! Merry Christmas ! What a beautiful cosy room, so warm and inviting! Your home is always so gorgeous. Wishing you and yours all the best in 2017.